There is a rock in the flower bed outside the office door to the backyard. If you glance at it quickly, and use your imagination, it looks like a heart. If you look closer, it still resembles a heart – just a little misshapen. Each day I walk outside (except during inclement weather), I glance over at the rock and take comfort from its presence. I cannot remember when I saw it for the first time, but I remember seeing it for the first time. It was not one of my better days and seeing the rock cheered me up. I thought it was there for me. A sign that God was with me. Part of me feels a little silly getting comfort from a seemingly random vaguely heart-shaped rock. Regardless, I still feel that comfort. On a difficult day, when everyone seems to have me in their sights, the rock is still there. Letting me know I am never completely alone. Then one day last week the rock was gone. 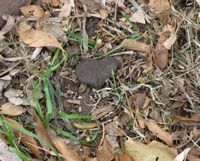 There was an indentation in the flower bed where the rock had been. It had rained recently, but there was no corresponding deposit of soil. Our dog, Misty, often buries food and digs it back up later. Cyndy and I thought we knew most of her spots, and she usually covers it back up. Regardless of the reason, the rock was gone. I felt lost. Which I feel rather silly admitting, but it is true. I walked around in circles, looking for where it might have ended up. The day did not seem right without the rock in its proper place. The rock had been a sign of hope. Was its absence a sign of the opposite? My mood was altered without a discernible reason. The temperature was beginning to get colder. I would kick around and peer through the grass and leaves, but it was not a thorough search. I would tell myself that it really was not worth it and I would just have to get used to it not being there. But the feeling of emptiness did not go away. When I went back outside, I found myself circling the area again, with the scenario repeating itself. A few days ago I was searching again – closer this time – and dug up a couple of rocks. I felt around and dug a little further. I do not know what caught my eye or caused me to dig where I did. But there was the heart-shaped rock. I placed it back up in a place of relative prominence near the bricks that border the flowerbed. I do not know if the rock is from God, but I would like to think he is using the rock – so to speak – to get a message across. If not to me, then through me, by my telling of the story. But I do know that there is a message here – one way or the other. We tend to take God for granted. We see the signs, and feel strangely warmed, but we simply come to expect them rather than appreciate them. We do not take time to thank God for the grace he bestows upon us. We take the fact that God is always with us, no matter what we do, way too literally. We forget our part of the covenant. Then something happens and we think God is not there. We walk around in circles, looking for him. We shuffle the grass and leaves wondering where he could be. Then we get desperate, praying that we will find him. After digging a little bit, putting forth effort and praying, God makes himself known to us. Letting us know he never actually left us in the first place. He did not fail us. We failed to live up to the faith God has in us.